1. 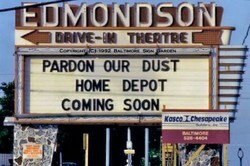 Edmondson Drive-In - Rt. 40 W Catonsville, MD. The marquee says it all. 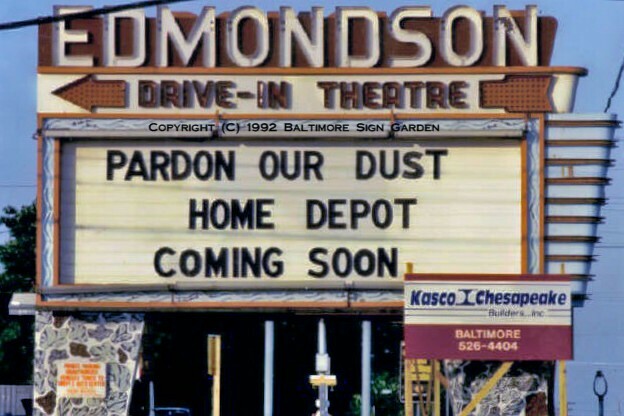 Torn down in 1993, a new Home Depot sign pylon with marquee mimics the original, but was built on the cheap and has not at all aged well. 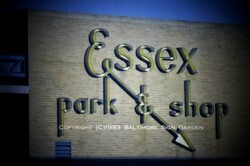 You can see this original lit up in action in the John Waters' 1982 film "Polyester". 2. 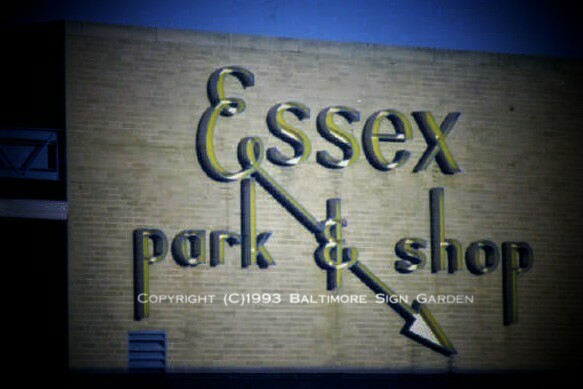 Essex Park & Shop - Eastern Ave., Essex. These well-crafted porcelain channel letters from the 1950's once illuminated with double-stroke gold neon tubes. They disappeared in 2007. replaced by a tacky church banner. 3. Esskay - E. Baltimore St., Balto. 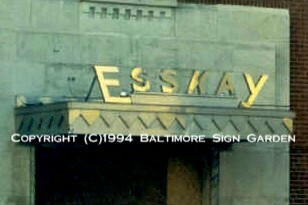 These beautifully crafted reverse stainless steel letters and canopy marked the entrance to the then Esskay corporate offices. 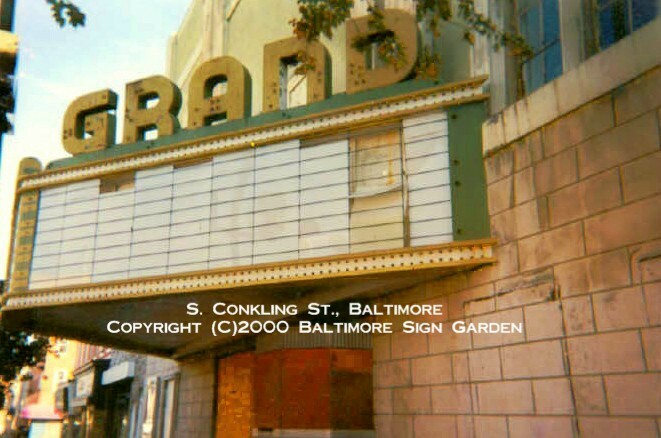 Demolished in 1998, I am told the Maryland Historic Society has them. I hope so. Built by Belsinger. 4. 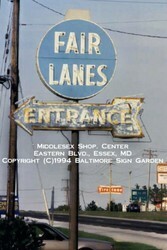 Fair Lanes Bowl - Middlesex Shop. 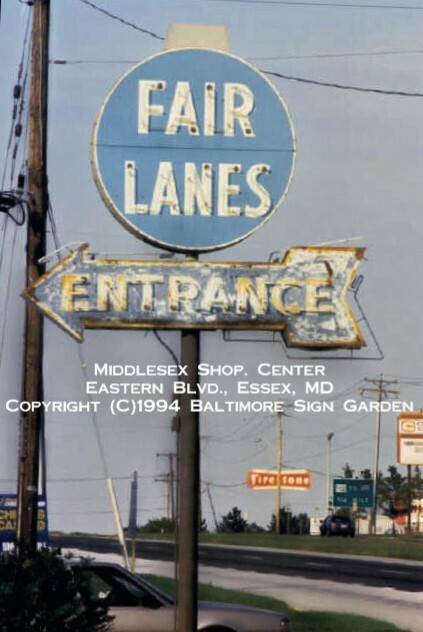 Ctr., Essex, MD. This 1956 neon display was replaced around 2000 with a backlit plastic sign. The Bowl is now closed. 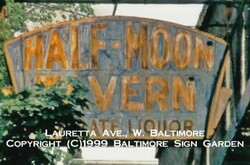 Note the old porcelain neon Firestone sign in the background which has since been replaced with a plastic backlit sign. 5. 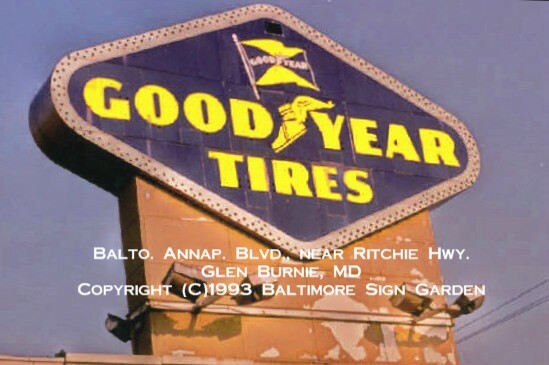 Goodyear - Balto. Annap. Blvd. at Ritchie Hwy., Glen Burnie, MD. I grew up watching the bulbs chase clockwise around the blue and gold neon tubes on this towering porcelain beauty. 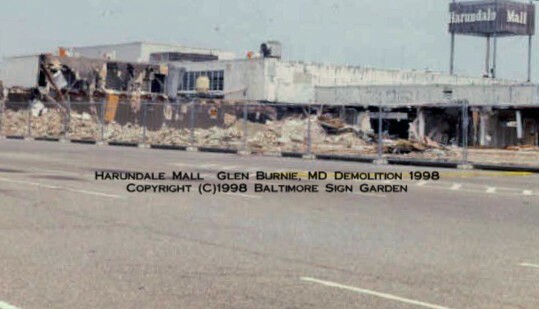 The 1940's site was cleared in 1997, and incorporated into the Tate car dealership. 6.Grand Theater - Conkling St., Balto. This great movie house did not go without protest. Foolishly demolished in 2004 (along with an original, still operating Little Tavern hamburgers building next door), The letters were plucked off recklessly at the last minute and forwarded to a salvage warehouse. This Theater can be viewed in the 1999 John Waters' film 'Cecil B. Demented' (along with the Patterson and then-blighted Hippodrome theaters). 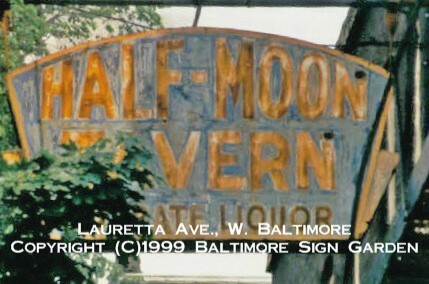 7.Half Moon Tavern - Lauretta Ave., W. Balto. I went back a year after I shot this photo and the entire block was gone. A policeman pulled me over for circling the block (with picture in hand) thinking I was there for other reasons! Goes with the territory, I guess! 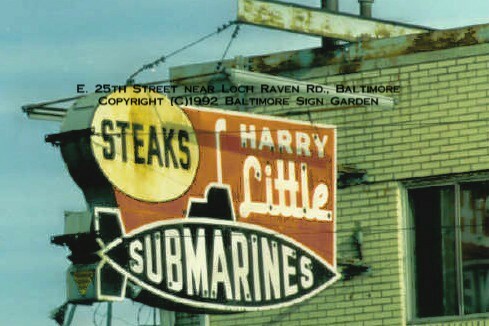 8.Harry Little Sub Shop - E. 25th st (off Greenmount Ave.), Balto. Long closed, this huge, heavy sign was removed around 2005. Built by Triangle Signs in 1956.